I love thrillers, especially those with an action/adventure style pace and plot. They are my escape from real life and I tend to open them and not stop until I'm done! I also like this style of movie, with lots of explosions, high body count but not horror. Yes, I also like reflective literature but thrillers are brilliant for the saturday afternoon hammock session. 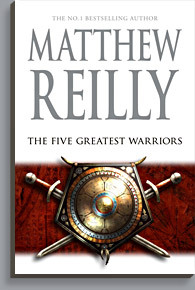 Matthew Reilly is one of my favourite authors in this genre and I buy everything he writes. His latest book is The Five Greatest Warriors and I have just finished reading it. Now my mind is overflowing with ideas that I want to bring to my NaNoWriMo novel, which will be a thriller so I wanted to share them with you. Have a deadline to keep the pace moving. All of Reilly's books have this deadline approach which is indicated by the date and time stamps throughout the book, as well as how fast the plot progresses. The countdown keeps you focussed on the end point, and turning the pages with anticipation. This is also a device used by Dan Brown in his novels and other successful thriller writers. Keep giving your main character a hard time, and keep the cliff-hangers coming. Reilly's protagonists, specifically Scarecrow and Jack West, have a very hard life. They seriously don't eat or sleep or rest at all. It is non-stop action, from one desperate situation to the next. There are awful choices they have to make, and physical dangers to endure as well as betrayal and pain. But this is a thriller, not a romance or an introspective literary piece. The main characters are there to inflict the plot onto, not to enjoy the ride! High body count. I love explosion movies and books with high body count, but only the ones where it is not too graphic. You know, A-Team violence where people get killed but you don't see the nasty bits. It's not horror, it's thriller. There is a line! Reilly does not let up with the body count and it keeps the pace going as well as keeping you emotionally involved (he has no qualms about killing off the good guys as well). There has to be investment in the book and death, destruction and violence are pretty important in this genre. Dastardly bad guy. Evil has to be personified in a thriller. The bad guy has to be killing people and will look like he is winning up to a point. Reilly has an original torture device in the book, and actually, I quite liked Dan Brown's Lost Symbol bad guy, Malak'h. His physical description was memorable with full body tattoos on a 6'3″ frame and also had an original method of torture. Multiple physical locations. I wonder if this is just a way to have tax-deductible trips but it certainly works to keep a reader engrossed in the book. Reilly's books jump all over the globe and encompass a huge physical scale. I love thrillers that use geography as part of the plot as I am also a travel junkie so this hooks me every time. Create interesting traps and puzzles to solve. Dan Brown has this as his primary hook but other thriller writers also use this device. One of Matthew Reilly's hallmarks is to include drawings of the physical locations, often underground caverns with complicated routes, mazes and traps. The protagonist has to solve clues to find various locations and combined with the lack of time, it also speeds up the pace. Hook the reader with pieces of truth they already know, and then expand them into the fiction. I have a theology degree and my bookshelves are weighed down with religious tomes, spiritual books and all kinds of conspiracy theories. So I love to read about locations or books or artefacts that have some truth to them, but then are often exaggerated into the fiction story. The Holy Grail is the obvious one for Dan Brown, and Matthew Reilly gets into Easter Island as well as the Egyptian Pyramids is his novels. The other author I love in this genre is James Rollins, who writes similar style ‘brainy thriller' novels. His latest is The Doomsday Key , another excellent fast read. Definitely check these guys out if you like a rollicking thriller novel! I will be doing another post soon on what I intend to write in NaNoWriMo, but certainly expect a thriller in this genre encompassing these lessons learned. What do you think are the keys to a great thriller? Thanks for posting these 7 lessons. They are excellent pointers for those of us attempting to write a thriller. I’m incorporating all of these ideas into my current work-in-progress, an occult crime thriller, based on a little known fact about the death of Aleister Crowley, the notorious 19th century occultist (http://www.ezekielcode.com/ashteaser.html). Hi Gary – you hooked me with Aleister Crowley – I’ve downloaded a sample to my Kindle. This is a fantastic example of internet marketing in action – proactive search by author, hooking avid reader with personalised comment… resulting in download and view of book sample and (potentially) a book sale. ASH: Return of the Beast is a supernatural crime thriller, a tale of revenge steeped in the occult. ASH is a work of fiction based on a little known factoid about the death of Aleister Crowley (1875-1947), the notorious occultist the British press once called “The Wickedest Man In The World”. Crowley’s body was cremated but the whereabouts of his funerary ashes has remained a mystery… until now. This diabolical tale propels the reader through a series of curiously interconnected (and sometimes unsettling) events spanning the years from 1947 (and the death of Aleister Crowley) to the 1990s and the coming-of-age (and eventual stardom) of a “death-metal” rocker named Rodney Duckworth. The time-line shifts to the present day where Brian Kane, a gruff and gritty, street-worn Seattle Police Detective, reluctantly teams up with the mysterious Rowena Ravenwood, an attractive female FBI agent. Their task is to figure out why good, healthy, God-fearing preachers in their fair city are suddenly dropping dead. What is the meaning of the strange symbols branded onto the bodies of these hapless victims? Are they all part of some bizarre cult? No eyewitnesses. No fingerprints. Is it really murder? Where’s the evidence? And what is the disturbing secret that Detective Kane is holding so close to his chest? The investigation catapults Kane and Ravenwood headlong into life-threatening situations as they wind their way through the strange, dark labyrinth of the world of the occult and find themselves battling for their lives against the powerful forces of ritual magick. Under no circumstances can this case go unsolved. An unspeakably horrendous end to the entire human race hangs in the balance. Problem is, the clues to help solve the case are in desperately short supply. Worse yet, so is the amount of time left to stop the mysterious killer’s reign of terror before all Hell breaks loose. And – according to Special Agent Ravenwood – that’s not just a figure of speech. Thanks for the kind words. But I hope you didn’t misunderstand my comment and thus be disappointed in the sample you downloaded. The reference to Crowley pertains to my current work-in-progress. It’s unfinished at this point. The sample you downloaded is from my debut novel, The Ezekiel Code, which is as described in the previous comment but it doesn’t have anything to do with Crowley. I apologize if that wasn’t clear. Also, I’m not sure how much of The Ezekiel Code is actually contained in the Kindle sample. However, if you go to my website, http://www.ezekielcode.com, you’ll see a little widget called “BookBuzr”. If you click on it you will be able to read the first 12 chapters of the book. Jeff Edis is another writer whose style is VERY similar to Matthew Reilly. Check out his book “The Trojan Device”! Good article! I love all the same authors as you (I write in the same genre! )!